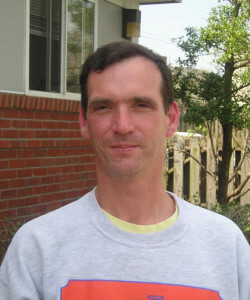 Joey Reed | Abrahamse & Company Builders, Inc.
Joey Reed has worked in construction since he was a teenager. After studying drafting and design at Piedmont Virginia Community College, he worked for Sperry Marine. Eventually, though, Joey returned to building, saying, “I like being out on the job, not sitting in an office.” Joey has been with Abrahamse & Company since 1995 and has advanced from carpenter to project supervisor. Declining invitations to become a project manager, he asserts, “I don’t want to get too far away from my tools.” He is a superb craftsman. His background in drafting and design helped Joey when he supervised the construction of a studio for John Grisham in the old Woolworth Building on Water Street. He recounts the details of this project: “The walls are clear plastic panels with stainless steel borders. You can see into the walls, see the studs and the screw heads, which are all decorative. The lighting is unique, too. The fixtures are recessed, with rope lighting on the ceiling. Even though the look is very modern, the lighting design gives it a soft, cozy feel.” The Bundoran Residence is among the projects featured on the company website that Joe supervised. Most recently, he was involved in a renovation of a historical home for a local architect. Joey’s hobby brings together his marine work and his love of construction. He enjoys building radio-controlled model wooden boats, replicas of 1930s era Chris Craft mahogany boats. After building the four foot long crafts, Joey takes his two sons out with him to run the boats on a local lake.